Since about 2002, I have been wanting to write a book about the family that included their history but also the history of that part of Douglas County which, to me, is vastly overshadowed by the history to the north in Lawrence and Lecompton but is nonetheless important. I've been in touch with other people who have been able to piece together more of the Miller family history and I feel that I am now in a position to start on the book and close the rest of the gaps that I have. Keep your eyes open for updates here and on Patreon. A special thanks to all who read and support my writing and research. If you would like to contribute, consider becoming a patron on Patreon or buying me a cup of coffee on Ko-Fi. I find it hard to believe that Hurricane Hattie hasn't seen Brutus with beard stubble before. I mean, she's over at their house 7, 8 times a week and usually talking with Brutus. 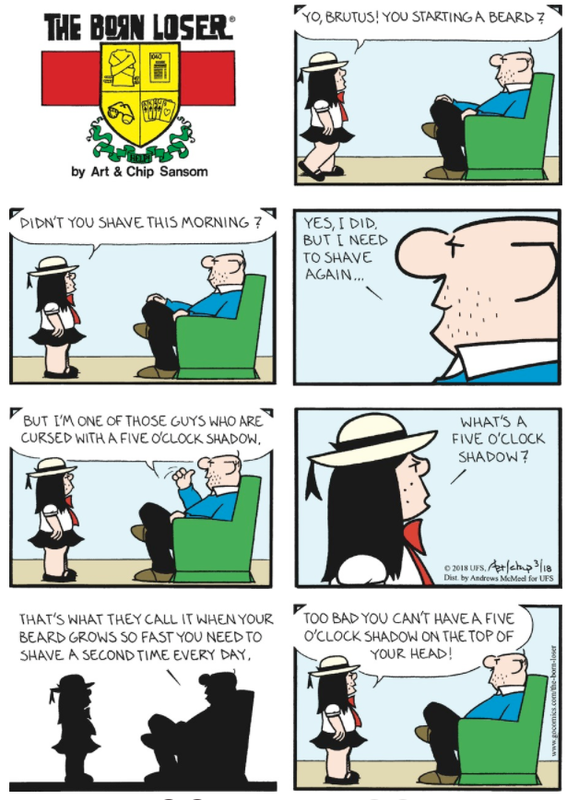 At least Brutus can tell Hattie as he is throwing her out of his house that because he's a guy "cursed with a five o'clock shadow" that explains why he has no hair on top of his head.